In the beginning, during the Freshman year of the class of 1956 (1952), there was an abortive attempt to start a “Glee Club.” I recall Tom Blackmore was involved. There was poor reception of the group and a lack of enthusiasm by the conductor. They gave only one concert. There was also a Schola Cantorum which was quite active but very small. Jack Padova, Don Davis, Tom Blackmore and I, Connie aka “Moose” Urban, were involved in the Schola. I also played the organ for some of the masses. The Schola was directed by Fr. Saelmann, a priest from the Netherlands. In 1953, our Sophomore year, Fr. Saelmann left Villanova and the Schola valiantly hung together sans director. At the same time, Dean Reuschlein arrived on campus with the assignment of starting a Law School at Villanova. Since we wanted to continue the Schola and hopefully expand to a secular group, AND since we had heard that Dean Reuschlein was an excellent organist and had been the Music Director of the Cathedral in Pittsburgh, we hoped he would rescue us. Early in October of 1953 Jack Padova and Connie “Moose” Urban went to Dean Reuschlein’s home to BEG him to take over the Schola and direct a secular group. I clearly remember him sitting at the dining room table dressed in a white shirt and vest, (since he was “relaxing” at home, he didn’t have his usual coat and tie on), with a cigar in a cigar holder. When we told him the reason for our visit, he protested that he did have a Law School to start! BUT he did love choral music, and he would consider it IF the students handled ALL the administrative duties. Then, almost as an aside, he added, “I just can’t stand the name GLEEEEE Club! I won’t do it if you call it a GLEEEEEE Club.” Connie suggested simply calling ourselves the “Villanova Singers,” which we could use for both secular concerts and religious liturgy. Conrad “Connie” Urban took on the job as first president of the Singers. Soon after we started officially as the Villanova Singers, there was a smaller group formed from within that group and we named ourselves “The Mainliners.” This was in reference to Villanova being on the Main Line of the Pennsylvania Rail Road, and we had no inkling of the association it would later make to the drug culture. We were still living in the days of innocence. We were also an all-men’s college. But we did have “sister schools” in relatively close vicinity. And it was to those sister schools that this small group would go to “sing for our supper” and to scope out the “talent” for future social functions! I am still trying to remember some of the old standards that we sang. The ones that immediately come to my mind are: Winter Song, Mister Moon, The Halls of Ivy, Margie, and some sea chanteys. (What Do You Do With a Drunken Sailor?, etc.). I also remember a wonderful arrangement of the Villanova Alma Mater by Dean Reuschlein. After Moose, Jack and other key members of the class of ’56 established a strong foundation with The Dean as the Director, ’57, ’58, & ’59 classmates came rapidly aboard to assist in building the rest of the structure. Urban, Padova, Valenti, Jannuci and Smith started the Mainliners and performed at all of our concerts. Their songs as I recall were based on barbershop arrangements and popular group quartets of the late 50’s. My Little Margie; Down By The Riverside; No, Not Much; Standin’ On The Corner; Halls of Ivy; I Had A Dream Dear; and occasionally a musical number from Turf n’ Tinsel’s closing original song – It’s Been Nice, It’s Sure Been Nice And We’re Mighty Glad You Came were the memorable songs. Being a Mainliner was a quest of many. Reason? They were a small number, mobile and ready to sing at the drop of a hat or an offer of refreshment of various kinds… food or liquid. They sang everywhere including formal and informal dances and parties, especially when Bobby Schiller ’57 and the Wildcat Five were playing. Bobby Schiller was a tangential part of the Singers as the Villanova Band Director. It was in 1956 when the Singers and the band joined together with RCA producing a 45 rpm recording of the Alma Mater, the Winter Song, the March of the Wildcats and “V” for Villanova. 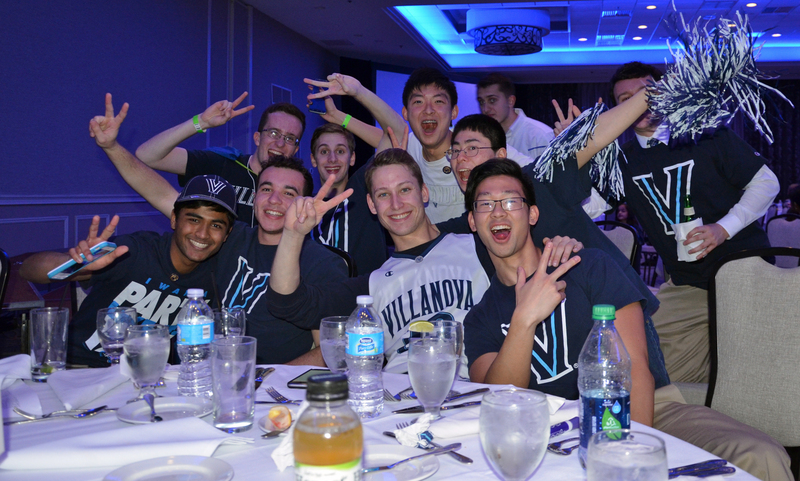 We didn’t sell a million but we did make Villanova history – the first recording. Our first television performance was on WHYY public television, arranged by Ed Rofi ’59. We sang the Winter Song, Brahms Lullaby, Lo How a Rose E’re Blooming, The Halls of Ivy, and the Alma Mater. In 1956 we had a major musical gathering on stage at the now Jake Nevin Field House. There were singing groups from Penn, LaSalle, Temple, St. Joes, Immaculata, Rosemont, Chestnut Hill with Villanova being the host. Each school did a medley of their own favorite songs and then we all joined together singing the Prayer of Thanksgiving and The National Anthem with the Dean directing. What a moment! There were +/- 3000 in attendance. We also sang Latin Mass at all of the university retreats and English hymns during special services in the Chapel. But, my most memorable experience was the Faculty Christmas dinner where we were the entertainment. The Dean finished his dinner and joyfully joined us on stage to direct us singing his favorite songs for all of the gathered professorial staff. Because he was in high spirits, he directed with gusto and, as a result, we enthralled the faculty audience who gave us a standing ovation. Afterwards the Singers went over to Rosemont and we serenaded each dorm with Christmas carols. When finished, we gathered together with the Rosemont Choral Group for songs and refreshments in their Tea House. Since we earlier had a joint concert with Rosemont, we sang some of the songs we did together such as the medley from Oklahoma. My favorite was the classic movement from Dvorak’s New World Symphony – Going Home. They were sweet memories. Last but not least, in our formative years Moose escaped and went to medical school for early admission. His departure left us without an accompanist and part time leader. Fortunately, Jack Padova took over the baton as student director and we were graced with a new accompanist Ken Macgillivray ’59 a superb pianist. Also, in addition to Chuck Brockman singing the first verse of the Alma Mater, Peter Scott ’56, tenor/soloist, would give a special presentation and beautifully sing Che gelida manina from La Boheme. During those early years we began to make our mark and add concerts each year. By 1957 according to Charlie Ross ’57 President, we sang in 21 formal concerts and performed in dozens of informal concerts on and off campus. We were on our way. 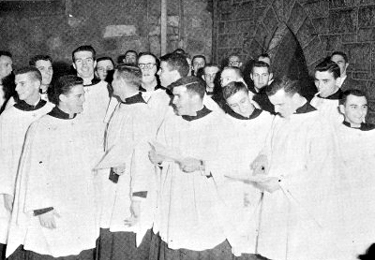 In 1957, at the young age of three years and with 70 voices, The Villanova Singers were making an impact. Finally, there are three members of the singers, class of ’57 who played 150 lb football at Villanova: Vince Cardella, Jim Judge, and Chuck Brockman. That’s a bit of trivia that is meaningless but had fond memories for the three. When I entered Villanova College as a freshman in the Fall of 1953, I met Dean of the Law School Harold Gill Reuschlein. That meeting was to prove of great import in my life. The Dean, as everyone called him, had only recently become the founding Dean of the Villanova School of Law, which opened its doors to the first class that Fall Semester of 1953. At forty-nine years of age, he was a dynamo. When Villanova decided to proceed with plans to create a law school, the search began for an individual to head the new institution. A nationwide search was conducted and the position was offered to Professor Harold Gill Reuschlein, then a faculty member at the University of Pittsburgh School of Law. He was appointed Dean in March of 1953. The Villanova School of Law opened its doors in September of that year. Dean Reuschlein built the school from the ground up and in 1956, the first class of 28 graduated. In that same year the American Bar Association granted full accreditation, while in 1957, the law school was tendered membership in the Association of American Law Schools. A subsequent recognition of its status was the granting in 1961 of a chapter of the Order of the Coif, the national law honorary; Villanova School of Law was the first church-related law school to be so honored. Not only had the Dean undertaken the complex job of constituting a law school in 1953, he had also been approached by a group of undergraduates and talked into taking on another project of a vastly different nature. 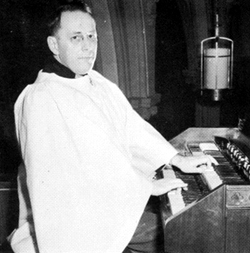 His reputation as the music director and organist at St. Paul Cathedral in the Diocese of Pittsburgh, along with other music activities over the years, had become known in the process of his candidacy for the deanship and so the students asked him to found a male choral group. He accepted that challenge as well. The Villanova Singers began in 1953 and I was one of the original members of the group, singing in the Second Tenor section. The Dean had great patience with those of us who were less than perfect in the execution of the liturgical, religious and secular music he had chosen for the repertory. Many of us had sung in high school choirs but the expectations of the Dean were of a higher caliber than those of our earlier directors. He was after perfection. He honed us into a finely-tuned chorus of male voices. Performing at area colleges and other venues with the Dean as conductor over my four years as an undergraduate at Villanova was a major aspect of my university education. And making “a joyful sound” as we performed popular tunes or conveying the deeper tonalities of a Mass or of a classical piece were exalting experiences. One felt the Dean’s own emotions as he led us in the variety of song and even though he was not an alumnus of Villanova, the singing of the Alma Mater stirred him greatly for the sound he elicited from us was indeed ethereal. The Dean passed away in 1998 at the age of 93. He was born on December 2, 1904 in Burlington, Wisconsin. He graduated from the University of Iowa in 1927 with a degree in history and on April 24, 1930 married Marcella Christien, his wife of nearly 69 years. Before attending Yale Law School, Reuschlein was an instructor in History at New York University, a position he continued during his law studies, as well as acting as choirmaster and organist at a New Haven church. He was multi-tasking before the phrase became commonplace. After graduating from Yale Law School in 1933, Reuschlein continued his legal studies at Cornell on a fellowship, where he earned a JSD, an advanced doctorate in law. Thereafter, he worked briefly at a Philadelphia firm as assistant general counsel but left when offered a position at Georgetown University in 1934. It was the beginning of a career in legal education that would span five decades, interrupted only by service in the Judge Advocate General’s department in the U.S. Army during World War II, earning the rank of Colonel. After Georgetown, he taught law at Notre Dame, Syracuse and Pitt. Having retired from Villanova in 1972 as Dean Emeritus, he became the Katherine Ryan Distinguished Professor of Law at St. Mary’s University of San Antonio. But he returned to Villanova in 1984, remaining an important force in the law school he had founded until his death. Through the sheer force of his personality and indefatigability, he shaped the law school from its founding and watched over it through many decades. “The Villanova Law School is largely the story of one man and his contribution to American legal education,” said the late John G. Stephenson III, a noted legal academic, in 1972. “No individual has given more to the cause of American legal education than Harold Reuschlein,” read the certificate presented by the American Bar Association, during an awards ceremony in 1992 in which the dean was honored with the Robert J. Kutak Award. Thanks to the commitment and vision of the Dean, just as the Villanova Law School has thrived and has had an impact on the legal profession, the parallel organization he founded in 1953, The Villanova Singers, continues to make a vibrant contribution to the cultural life of Villanova University, the Philadelphia area, and far-flung places throughout the U.S and the world. The alumni of the Singers have created the Villanova Singers Legacy, an organization that has met at the university in 2007 and 2008, and will do so again every two years. The Villanova Singers Legacy is a tribute to Dean Harold Gill Reuschlein as founder and inspiration to the directors who followed him in the creation of a brotherhood of song.